It was a cool, blustery, October morning in 2007 when I realized the difference between work and labor. I was standing on the side of a country road in Tumwater, Washington waiting for my work crew to come pick me up. I had moved from Tennessee to the area just days before – a recent graduate with a service year ahead of me. I had accepted a contract position with the Washington Conservation Corps, a program dedicated to salmon habitat conservation and restoration ecology. I was soon picked up by my fellow corps members and taken to our lock-up. 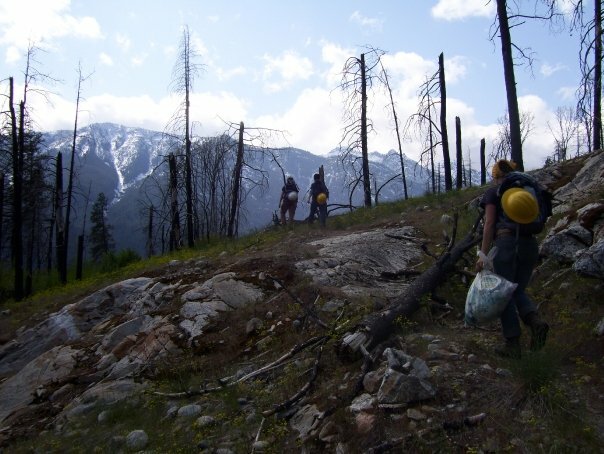 Here, we loaded our rig with numerous tools for trail construction – Pulaski’s, Macleod’s, chain saws and more. By that evening we had bagged Eagle’s Peak in Mount Rainier National Park, completing the fall drainage on the trail. It was my first day of “spike,” eight days in the back country digging re-routes and building trail – my first vivid memory of inclined labor. I had of course labored before this day, but this experience sticks out because I was fortunate enough during my time on the mountain to wake up every day and enjoy my labor. I enjoyed the manual exercise, crafting trail, working lightly on the land and exploring the forest. These activities were required of the job, but they did not feel like work. I viewed these tasks favorably, I was disposed towards these activities – to labor with the rock and soil of Earth. The job felt different from anything I had done before, it fit with my belief system and attitude towards life. I was practicing conservation and further developing a sense of wildness. In the morning when thou risest unwillingly, let this thought be present- I am rising to the work of a human being. Why then am I dissatisfied if I am going to do the things for which I exist and for which I was brought into the world? Or have I been made for this, to lie in the bed-clothes and keep myself warm?- But this is more pleasant.- Dost thou exist then to take thy pleasure, and not at all for action or exertion? Dost thou not see the little plants, the little birds, the ants, the spiders, the bees working together to put in order their several parts of the universe? And art thou unwilling to do the work of a human being, and dost thou not make haste to do that which is according to thy nature?- But it is necessary to take rest also.- It is necessary: however nature has fixed bounds to this too: she has fixed bounds both to eating and drinking, and yet thou goest beyond these bounds, beyond what is sufficient; yet in thy acts it is not so, but thou stoppest short of what thou canst do. So thou lovest not thyself, for if thou didst, thou wouldst love thy nature and her will. But those who love their several arts exhaust themselves in working at them unwashed and without food; but thou valuest thy own own nature less than the turner values the turning art, or the dancer the dancing art, or the lover of money values his money, or the vainglorious man his little glory. And such men, when they have a violent affection to a thing, choose neither to eat nor to sleep rather than to perfect the things which they care for. But are the acts which concern society more vile in thy eyes and less worthy of thy labour? There is much to say about this quote. Personally, it has helped me mold together an idea that I call inclined labor. I write about inclined labor often but I have never defined the concept. It is my wish to do so in this blog post. To be inclined is to feel a willing to accomplish, or a drawing toward, a particular action belief or attitude. Labor is physical or mental exertion – but it is very different from work. Work is a series of tasks that must be completed to achieve a certain goal – be it to gain a wage or to see that something functions properly. Labor is categorically different. Individual labor happens on its own terms, willed by the desire to complete a task. Work must be done, it is an intended activity. Inclined labor, however, is the physical and mental exertion that human beings are drawn to. In the morning when thou risest unwillingly, let this thought be present- I am rising to the work of a human being. Why then am I dissatisfied if I am going to do the things for which I exist and for which I was brought into the world? Inclined labor is the true work of a human being – and it can only be actualized in liberty. Today we work plenty but struggle to find time and energy to award ourselves the opportunity to truly labor. Work for economical means is a relatively new activity of human beings. Every civilization has had to work – chores need to be carried out for society to function. For the vast majority of our 200,000 year history as a modern species, however, our societies were much more egalitarian. In our early history there was much more labor – individuals knew their interests and carried out their functions and roles within their communities. It was not until the rise of power structures in the age of the ancients that human labor was viewed as something to command and control. Such authority has only exacerbated under the rise and fall of nation-states. Work as we know it today has only been dominant across the whole of society since the advent of industrial capitalism. Work is no longer something that is shared cooperatively for the functioning of society – work now defines a controlled economic system. But we are a vigilant species. Over the millenia, and ever persistent today, human beings have continued to labor. How could we not when labor is inclined? Imagine an economic system crafted by liberated human beings. What are the possibilities of humanity? How would the products of self directed labor progress and build society? What can we craft together during our time in the sun? What will liberated labor gift to future generations as we progress for millenia to come? How wondrous our civilizations and progress will be! Inclined labor, whether a physical or mental exercise, is the creative expression of our interests and ingenuity – it is what we are driven to do. Our labor deserves to be liberated for it is ours and solely ours. Inclined labor is the true calling of human beings. Brilliant. I enjoyed this immensely. Thanks again.